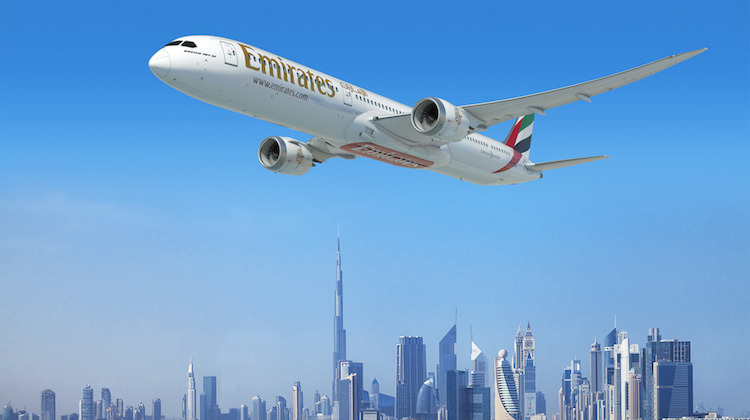 Boeing has secured a long-sought after order from Emirates Airline for a fleet of new widebody aircraft, with the Dubai-based carrier putting pen to paper for 40 787-10s. The commitment from Emirates to purchase the 787-10 is a big win for Boeing, given the Gulf carrier had picked the Airbus A350-900 and A350-1000 previously but cancelled the order for 70 of the type in 2014 following a fleet review and delays to the program. The Qantas alliance partner then restarted negotiations with both Airbus and Boeing, pitting the 787 against the A350 for the replacement of its Boeing 777-200s and 777-300s, as well as A330 and A340 fleet (which have since been retired). The decision to go with the Boeing twinjet was announced at the Dubai Airshow on Sunday (United Arab Emirates time). Emirates Airline chairman and chief executive Sheik Ahmed bin Saeed Al Maktoum said the aircraft would be delivered from 2022. “Some of these will be replacements so that we maintain a young and efficient fleet, and others will power our future network growth,” Al Maktoum said in a statement. The choice of engine would be made at a later date. Emirates said its agreement with Boeing included conversion rights to the smaller 787-9. Further, the Dreamliners would be configured in either a two- or three-class layout, seating between 240 and 330 passengers. The 787-10 is the longest variant of the 787 family and is capable of flying 6,430nm when configured with 330 passengers in a two-class layout, according to Boeing figures. Singapore Airlines is the launch customer of the 787-10, with first delivery expected in the first half of 2018. The Virgin Australia shareholder and alliance partner has 30 787-10s on firm order, as well as a letter of intent for a further 19 of the type. The airline has chosen Rolls-Royce engines for its 787-10s. Airlines that fly to Australia and have ordered the 787-10 included ANA, SIA, Etihad Airways, EVA Air, United and British Airways. The Boeing website lists 171 orders for the 787-10 as of October 2017, which does not include the Emirates order. “Emirates’ commitment pushes the total number of new 787 orders and commitments this year to more than 180; and more than 210 orders and commitments for the 787-10 overall,” Boeing said in its statement. Boeing Commercial Airplanes president and chief executive Kevin McAllister said the Emirates order would “sustain many jobs in the United States”. Emirates already has 150 777-8 and 777-9s on order from Boeing, with deliveries of the latest version of the popular 777 type due to begin in 2020. It is the world’s largest operator of 777s. Would like to see this aircraft in the Qantas fleet. Come on Alan. Please put pen to paper. Qantas should really grab these. Perfect size, perfect range for Asian routes, and even NZ. Flame me if you wish but QF, will now remain Boeing for the long term future. Agree that QANTAS should select this aircraft over any Airbus planes. Flights to NZ on a 787-10? No way. Too much capacity. Too much capacity on flights to NZ? Considering there’s a bunch of 737 flights each day, and Emirates currently stop in Aus and fly to NZ picking up where qantas used to fly 747s. Air NZ used to fly 747s and Air NZ still fly 777-300s to Aus. Think the 787-10 would be perfect for at least 1 daily flight between Melbourne, Sydney & Brisbane to Auckland. A330s were just refurbished and should last a decade so I wouldn’t expect announcements anytime soon. I’m confused frankly! Where does the B787 series (8, 9 & 10) slot in with the B777 series and the “proposed”, but yet to be confirmed, NMA mid-sized wide-body … a B767X in effect? Too many aircraft of similar configuration, range and capacity coming out of Seattle at the moment! How do the airlines’ bean counters work out what aircraft type will be their best fit and be most profitable? Qantas should select the A350 over the B787; it is far superior in (economy) passenger comfort. People are already dubbing the 787 as the ‘Squeezeliner’. 777 is a bigger aircraft with up to (approxs) 330 to 400 seating and up to 200sqm cargo. 787 seats 260 t0 340 and 160sqm cargo. I think for Emirates the 777 if far too big for its regional routes to Eastern Europe, South Asia, and Africa, and so the 78-10 will be perfect. Flydubai would then cover the Middle East with its narrow bodies. @AlanH the 777-8 is similarly sized to the 787-10, still slightly bigger but has much superior range. But the -10 wasn’t designed for very long range it was designed to be really efficient on routes that the A330-300 seems to hold most. The NMA/767X from what I’m hearing is designed to be like the 767-200 a small widebody, but they want it to have the range of the 787-8. I agree – there seems to be considerable overlap in B787 and B777 markets. Further muddying the waters is the proposed size of the NMA aircraft – which at 250-270 seats, is vast and well above where the market void appears to exist post B752/B762/A310. At 250-270 seats it is skewed much closer to B787-8 than B737MAX-10. The actual void seems to be wide-body, intercontinental (5000+ NM), and 3 class with 160-200 seats, but the NMA proposal is way above that. Furthermore, carriers like Qantas have voiced interest in NMA for domestic capacity, which is bizarre as the market void / niche now undertaken by aging aircraft like B752 is long-thin intercontinental routes. If anyone can explain this I’m all ears. The Boeing 747 is now an historic aircraft and the 787s do no have the cabin space of the A380. The 777 has been around a long time and is being tinkered with, to provide the cabin volume for airline premium products which are easily provided by the A380. Boeing basically committed to hub busting forgetting that passengers do not like sitting for 20 hours with their knees under their chins. I am just wondering if the 787-3 would have made the better fit for the B752/B762 series replacement? Unfortunately the B787-3 is not the answer to the B752/B762 replacement. It was a proposed a ‘short-range’ variant, not a ‘short-capacity’ variant. It was pitched towards Japanese requirements to replace other SR variants like the B747SR – which was high capacity and strengthened in various areas to accommodate increased flight cycles based on short domestic legs within Japan. The B787-8 would need to lose at least 50 seats to become a viable NMA option, much like the B747SP was a dramatically re-engineered aircraft. Boeing has never entertained a specification like that for the B787. As AlanH and Teddy have identified, the market mix at Boeing (B777/B787/NMA) is rather confusing, and seems at any rate to be larger than B752/B762. @Brandon Finch the 787-3 would be a domestic 767-300 replacement rather than a 762 replacement. They would have to go smaller still to do that, which is what the “797” idea is about. Brendon the 78-3 is simply too heavy and AJ has said that. – Agreed, the 787-10 is a perfect replacement for the A330 or the 767 etc. I expect the -10 to become very popular for various airline customers. About “777s are too large for Emirates’ Europe routes’ comment. @ Teddy Re Qantas interest in the NMA. Thanks – that does explain Qantas’ motives. I’m still unsure though how the proposed Boeing NMA (at 250-270 seats) fits the size that is needed. I would have thought a new small wide-body aircraft sitting between the B752 and B762 in size was where the true void is – and 250-270 seats considerably larger than that. Perhaps a large version of the NMA is 250-270, but the small version fitting in the B752/B762 void is somewhere around 160-180 seats in 3 classes. I think Boeing have a number of concepts in mind and going through the process of trying to find the version that has the most appeal. I wouldn’t be surprised if Airbus are also working on something but are not discussing options in public. I guess anything from a rewinged A321 to a clean sheet design.